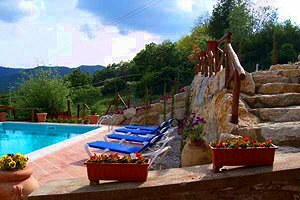 The villa is situated 850 metres above sea level in Caprese Michelangelo (Arezzo), in Casentino, and enjoys a magnificent view over the surrounding mountains and valleys. 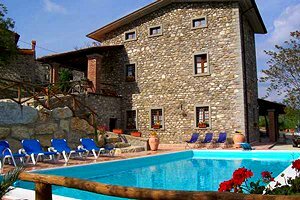 The ancient peasant house is surrounded by a fully fenced garden equipped with wood-burning oven/barbecue and furnished with outdoor furniture. 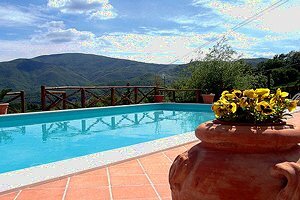 In the estate are also a small deconsecrated church and the private swimming pool (5x10 m; depth: 1.10-2.30 m), warmed by solar panels. 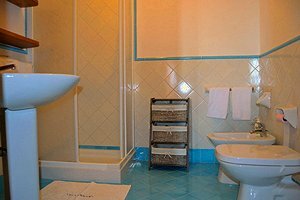 The pool side is paved with terracotta tiles and furnished with sunshades, sun loungers and deck chairs. 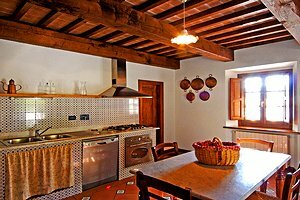 The villa features also two porches furnished with table and chairs for having meals al fresco. 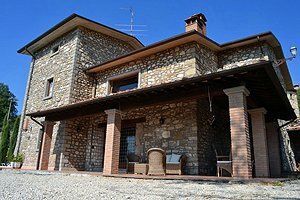 Renting the villa is an excellent solution for those who dream vacations in Tuscany in close contact with nature: the estate borders with the Casentino National Park , where guests could have wonderful walks. A riding stable is in proximity to the estate, whereas a tennis club and a golf club are within easy car distance. 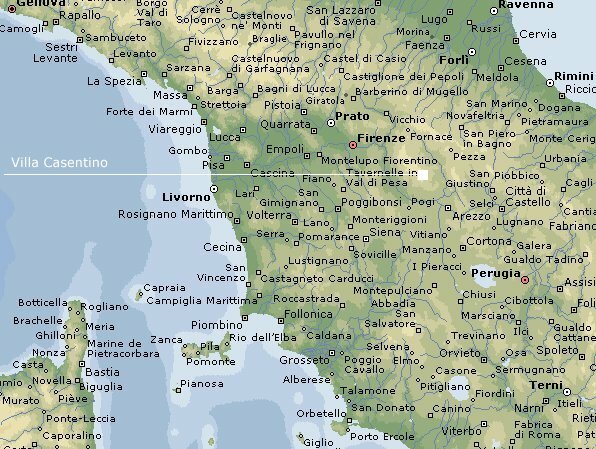 Those who love art and culture can visit many more or less famous Tuscan towns, including Sansepolcro ( Piero della Francesca`s home town ), Anghiari, Arezzo, Pieve Santo Stefano and the Sanctuary of La Verna . 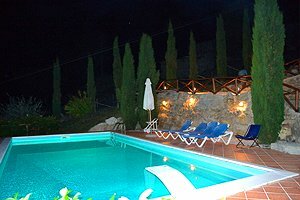 The villa is a three-storey building; it sleeps 14 people in 4 double bedrooms and 3 twin bedrooms, and has 4 bathrooms. 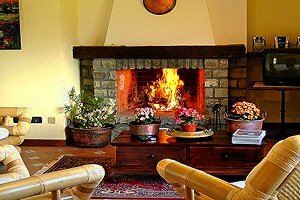 The ground floor composes of kitchen, large living room with fireplace and dining table, a twin bedroom, two double bedrooms (one with ensuite bathroom with shower) and a bathroom with shower. 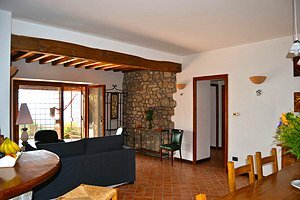 On the first floor are a kitchen, a large living room with fireplace and dining table, a twin bedroom and a double bedroom with ensuite bathroom with shower. 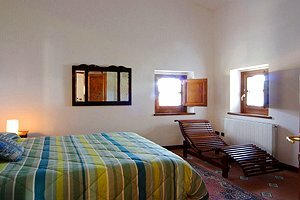 The second floor is divided into a twin bedroom, a double bedroom and a bathroom with shower. 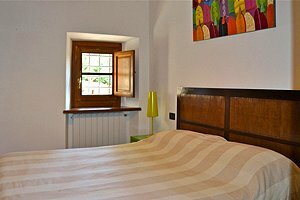 The villa is equipped with swimming pool, wood-burning oven/barbecue, Wi-Fi Internet connection, microwave oven, oven, dishwasher, washing machine and private car parking place. 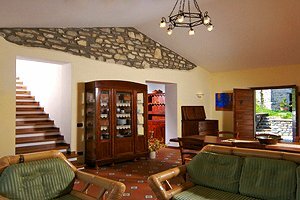 Any kind of shops and services are in Caprese Michelangelo (5 km). 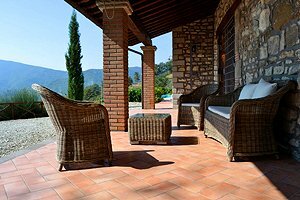 Riding stable: in proximity to the estate; tennis club: within 6 kilometres from the villa; golf club: within 25 kilometres.